Asparagus, finally! That wild mint is especially beautiful, isn’t it? This entry was posted on June 5, 2011 by Megan @ When Harry Met Salad. 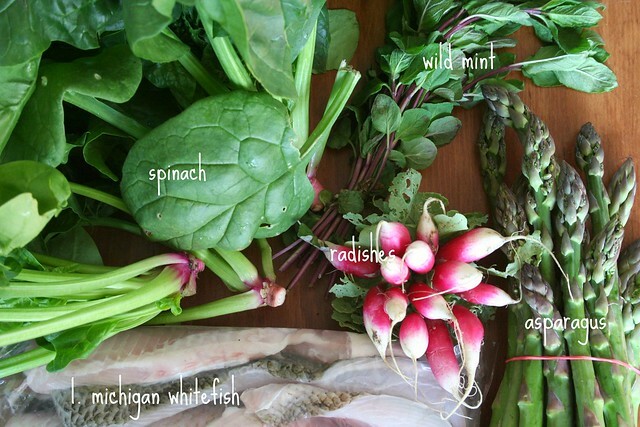 It was filed under farmers market and was tagged with asparagus, mint, radishes, spinach, spring, whitefish. Not this year. I love love LOVE the idea of CSA programs and for the past two summers I’ve been involved with a farm that allowed me to work for my CSA share, but I had a hard time shuffling my schedule to fulfill that obligation, so this year it’s just me and the farmers market. There’s only two of us, and one of us doesn’t like vegetables, so our CSA share was also sometimes a bit overwhelming.